The true story of Amy Carmichael and her looking glass. Out of the mirror two eyes peep. A young girl wonder if God has answered her prayer. Amy wants a new look. She wants blue eyes now and not brown. When Amy sees that the brown eyes are still there, tears begin to fall. 'Why hasn't God answered my prayer?' she storms. 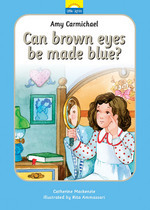 But God knows that there are other children with brown eyes who needs Amy's help. Amy learns that God always answers prayer - and He always does what is best.